There comes a time in every person's life when an upgrade to a real home theater system is in order. The gear can cost a fortune, but it doesn't have to. If you're not sure what you need or how much you should spend, the Yamaha YAS-101 is a good place to start. 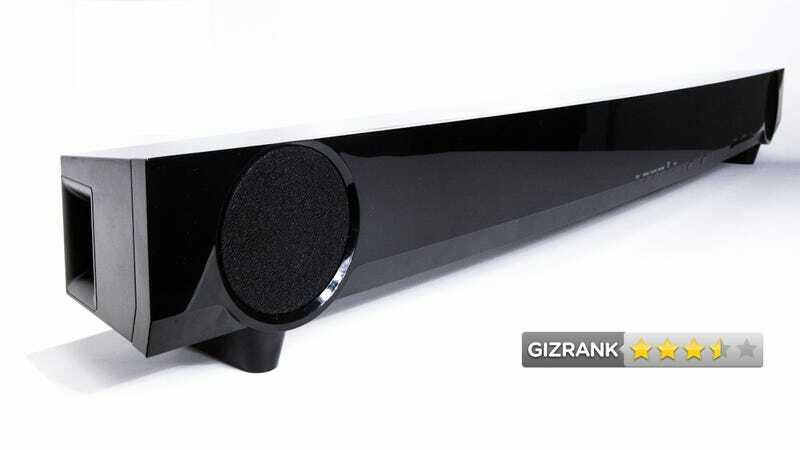 A $300 soundbar that delivers the type of 5.1 channel surround sound found in much more expensive systems. People without a home theater who want to step up their gear's game. Or just people with tiny apartments. The YAS-101 has a sleek, piano-black finish that looks impressive sitting right below a TV. Some soundbars come with external subwoofers, but the one in the YAS-101 is built-in, giving it a wide profile. The ultra-simple setup takes five seconds. Just plug the TV to the soundbar with an optical cable. A remote allows you to control volume and to toggle between stereo and surround sound modes. Excellent bang for the buck in an unbelievably easy-to-use package. There's no easy way to connect your smartphone, iPhone, or computer to the soundbar, so listening to music out of it is a pain. Despite the built-in subwoofer, there's an output for an additional subwoofer—as if that's something you'd spring for when you're buying the cheapest soundbar in the world. • Inception on Blu-ray sounded well-balanced across the tonal range, and the internal subwoofer delivered convincing bass. Over a month of testing, moments like this made the Yamaha (almost) perform like a great home theater system. • Music sounded terrible on an iPhone hooked up through a TV, but Pearl Jam Twenty, on Netflix streaming, sounded great, with plenty of nuance and good dynamics. • Playing Mass Effect 3 through the system was a pleasure. It does a nice job of emulating a full surround sound system (but you don't quite hear shell casings hitting the ground behind you). At times, the lack of an independent subwoofer left the sound a bit tinny. Yes! Especially if you've got a HDTV and no sound system.